Description: What Potential Does Psychotherapy Have For Mediating The Impact Of Childhood Developmental Trauma On Adult Life?Combining Knowledge From Trauma-Focused Work, Understandings Of The Developmental Brain And The Neurodynamics Of Psychotherapy, The Authors Explain How Good Care And Poor Care In Childhood Influence Adulthood. They Provide Scientific Background To Deepen Understanding Of Childhood Developmental Trauma. They Introduce Principles Of Therapeutic Change And How And Why Mind-Body And Brain-Based Approaches Are So Effective In The Treatment Of Developmental Trauma. The Book Focuses In Particular On Pesso Boyden System Psychotherapy (Pbsp) Which Uniquely Combines And Integrates Key Processes Of Mind-Body Work That Can Facilitate Positive Change In Adult Survivors Of Childhood Maltreatment. Through Client Stories Petra Winnette And Jonathan Baylin Describe The Clinical Application Of Pbsp And The Underlying Neuropsychological Concepts Upon Which It Is Based. 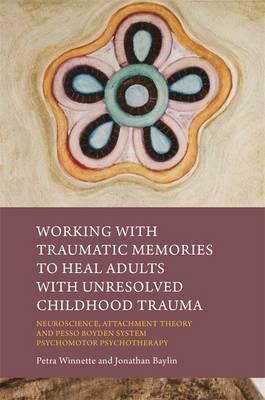 Working With Traumatic Memories To Heal Adults With Unresolved Childhood Trauma Has Applications Relevant To Psychotherapists, Psychologists And Psychiatrists Working With Clients Who Have Experienced Trauma.